Posted on March 27th, 2019 by Richie Koch in Articles & News. The European Parliament passed a new copyright directive containing the controversial Article 13, the so-called “meme ban.” ProtonVPN is committed to helping mitigate the negative effects of this law on Internet freedom. On Tuesday, the Directive on Copyright in the Digital Single Market became official EU policy. 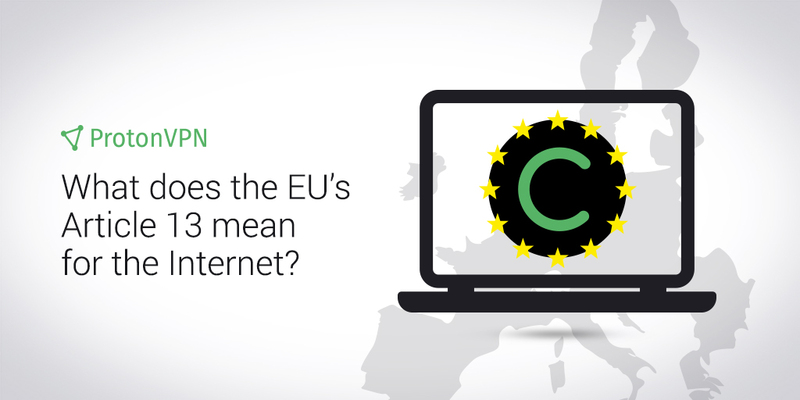 Now EU member states must more strictly regulate fair copyright use on the Internet. Critics, including academics, civil society organizations, tech companies, and some of the Internet’s pioneers, argued that the directive, specifically Article 13, goes too far. They claim this directive will alter the very nature of the Internet and could violate individuals’ right to free speech. Despite these concerns, the MEPs voted not to debate any proposed amendments to the bill. The directive, which has been debated for years and extensively modified, shifts the burden of detecting and preventing copyright infringements onto for-profit online platforms and sites that host large amounts of user-generated content. This transforms the way copyrights are governed for sites like Facebook, YouTube, and Twitter, which currently are not responsible for the content their users post on their platform. These platforms are required by law to remove content that violates a copyright, but only when the rights holders instruct them to. The motivation behind Article 13, according to their supporters, is to limit the power of large platforms and to make sure these platforms more equitably share their revenue with the musicians, journalists, and artists that create the Internet’s content. Protesters argue that, depending on how the laws are implemented, they will result in the broad censorship of the Internet and could actually empower the large tech platforms, as they will be the only companies that can afford the tools necessary to filter out copyrighted material. Since this measure is a directive, EU member nations will have two years from when the directive is officially published to pass their own laws that put the objectives outlined in Article 13 into effect. An EU directive, unlike an EU regulation (like the GDPR), is not a law across the EU. A directive designates an objective all EU members must enforce within their borders, but EU members are free to determine their own law to achieve that objective. What is wrong with Article 13? Article 13 states that “online content sharing service providers and right holders shall cooperate in good faith in order to ensure that unauthorised protected works or other subject matter are not available on their services.” The intention behind the bill, to ensure creators are paid for their work, is a good and noble one. Most objections arise from how this goal will be achieved. Previous versions of the directive mentioned “proportionate content recognition technologies,” and while these lines are not in the amended version that was passed on Tuesday, all experts agree that an upload filter is the only way these platforms could ensure none of the millions of photos, videos, or GIFs that users post every day do not violate any copyrights. Copyright law is notoriously complex. While the directive has outlined protections for content that is a “quotation, criticism, review” or “caricature, parody or pastiche” of copyrighted works, which seems to protect memes, teaching a filter to make those judgments reliably is another matter. Even if the filters get better over time, content that seems to be an outright violation of copyright law could be allowed because a user has an agreement with the rights holder. Platforms will also be incentivized to “over-filter” and block content where there are disagreements over who is the proper rights holder to avoid penalties. All of these factors could lead to large amounts of Internet content being blocked within the EU. And then there is the concern over the chilling effect that using artificial intelligence to determine what content is allowable could have on free speech. This will create a demand for filtering services — services that only the largest, richest tech companies can afford to develop. YouTube’s Content ID, which already filters some of its videos for copyright violations, cost $60 million to develop. Imagine an enhanced Content ID being applied across all major public platforms. This will only give Alphabet, YouTube and Google’s parent company, more power to determine what qualifies as valid speech on the Internet for millions of European citizens. We would like to see artists, journalists, and musicians compensated for their work, and we want to live in a world where exploitative tech platforms do not have so much power over the content creators they profit from. But ironically, Article 13 could place the Internet, once a free and open public space, further under the control of monopolistic tech giants. ProtonVPN’s founding mission is to give people around the world a secure, private way to access the Internet and to preserve their freedom of speech. We have stood up to governments for our users’ privacy rights, presented the importance of encryption to the UN, and supported news outlets in face of censorship. We remain committed to these goals. Our free VPN service is always available to anyone who wishes to access blocked content. Over the next few months, much will hinge on how the national legislative bodies approach the task of implementing the directive. National laws could mitigate some of the more harmful effects, or they could shift the burden of fair use from the rights holders having to demonstrate a copyright violation to users having to prove that their content is legal. Citizens of EU member nations who object to Article 13 still have time to organize and to contact their local representatives. Article 13 has passed, but there is still time to influence how the national laws implementing it will be written. Articles like these remind me why I choose to pay for your services. Thanks for your work! Hello! Thank you for choosing our services. Your support means a lot to us!